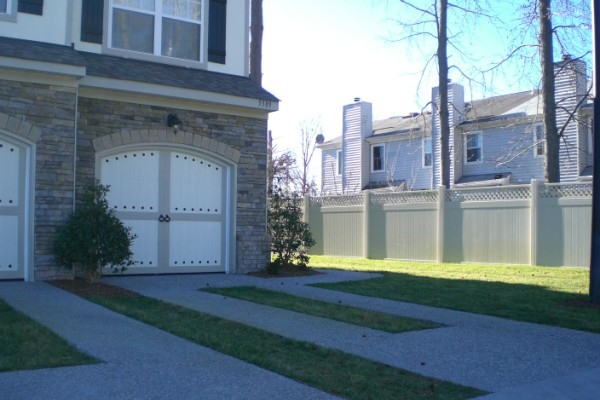 What are the Benefits of a Vinyl Fence in Richmond? Are you thinking about getting a new fence for your home or business in Richmond? There are lots of different styles of fence to choose from, but vinyl might be one of the best all-around choices in terms of convenience and affordability. Learn more about vinyl fences in this week’s blog, and you just might find that you’ve made up your mind on vinyl! Vinyl fence is one of the easiest kinds of fencing to install. This makes it more affordable for you, and gets your fence up faster! There are lots of color options with vinyl fences that aren’t available with other kinds of fencing. Plus, because this color isn’t painted on, it will never fade, and you’ll never have to repaint it! Vinyl fence is by far the easiest kind of fencing to maintain. It will never rust, never fade, never rot, and you’ll never have to paint it. An occasional wash will keep your vinyl fence looking like the day you got it. If you want a fence that doesn’t require a lot of upkeep vinyl fencing in Richmond should be at the top of your list. Another great thing about vinyl fencing is that it’s very durable and long-lasting. Vinyl is stronger than wood, and because it never rots, you never have to worry about the effects of the weather on your fence. A vinyl fence will last you a very long time, giving you a great return on your investment. In terms of cost, the only investment you’ll make on a vinyl fence in Richmond is the initial one for installation. Once the fence is installed, you’ll never have to pay for paint, primer, rust cleaner, or other maintenance needs common with other fencing. Vinyl fencing has a lot of benefits that make it hard to beat. If you’re interested in a vinyl fence in Richmond, contact Hercules! Hercules Fence of Richmond has been providing professional fence installation and service in Richmond for more than 50 years. Call us at (804)752-7992 or contact us on our website to learn more about residential and commercial fencing in Richmond. This entry was posted on Friday, November 14th, 2014 at 3:16 pm. Both comments and pings are currently closed.